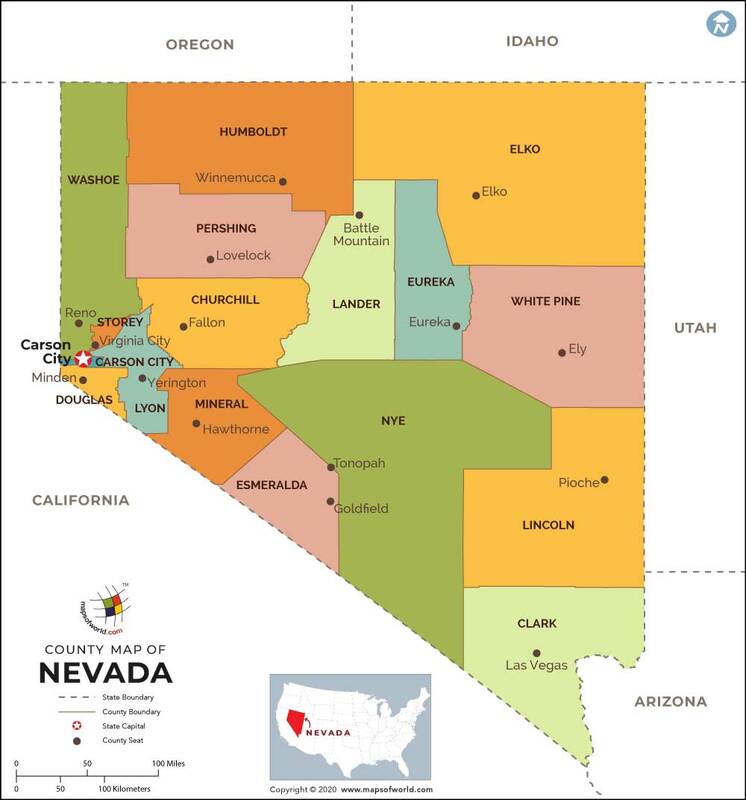 Our Nevada County Map shows all 17 counties in Nevada. Counties are divisions of government within a state, and each county is administered from a county seat. Lander county, founded in 1862, occupies a total area of 5494 sq miles and has a population of 5794. Churchill county, founded in 1861, covers a total area of 4929 sq miles and has a population of 23,982. Lyon county, founded in 1861, occupies a total area of 1994 sq miles and has a population of 34,501. White Pine county, founded in 1869, spans an area of 8877 sq miles and has a population of 9181. Douglas county, founded in 1861, occupies a total area of 710 sq miles and has a population of 41,259. Pershing county, founded in 1919, occupies a total area of 6009 sq miles and has a population of 6693. Clark county, founded in 1909, occupies a total area of 7911 sq miles and has a population of 1,375,765.